Jazz Combos 1, 2 and 3 as well as the Jazz Guitar Quintet will kick off the celebration of Jazz Week at the University of Louisiana at Lafayette on April 3 and 4. Sponsored by the School of Music, Jazz Week will take place in the Bayou Bijou Theater of the Student Union. On April 3, Jazz Combos 2 and 3 will be featured. Directed by Dr. Garth Alper, Jazz Combo 2 is comprised of outstanding instrumentalists who have achieved an intermediate level of jazz improvisation skills. Jazz Combo 3, directed by Dr. Paul Morton, is the entry-level small jazz group, designed for students with beginning to intermediate jazz playing abilities. The concert on April 4, will feature the Jazz Guitar Quintet and Jazz Combo 1. Directed by Dr Jeff George, the Jazz Guitar Quintet features five guitarists plus bass and drums playing arrangements of contemporary jazz compositions. Jazz Combo 1, the university's most advanced small jazz group, is directed by Dr. Robert Luckey. This exceptional group of advanced improvisers will perform a challenging program of jazz tunes in a variety of styles. Each concert will begin promptly at 7:30 pm. 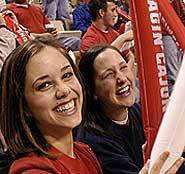 UL Lafayette students and senior citizens will be admitted for $4, and general admission will be $6. For more information call 482-6012.